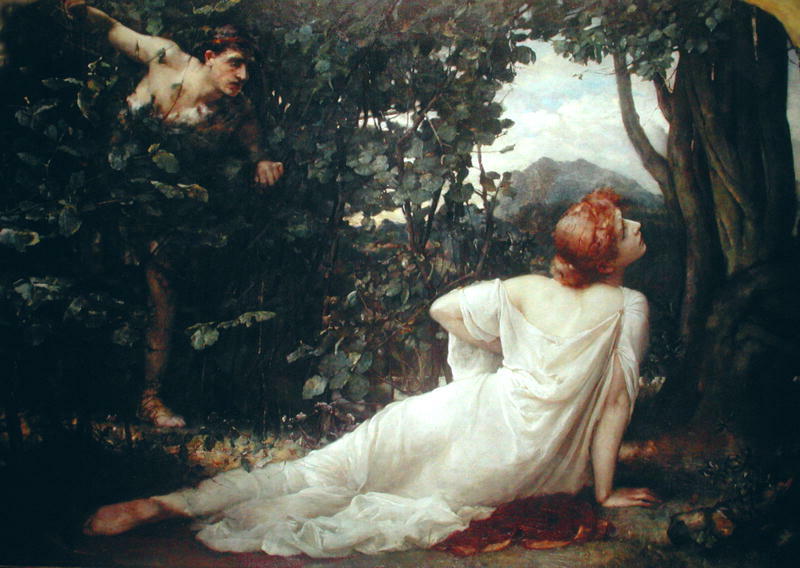 Procris was a mortal princess of Greek mythology who was married to Cephalus, the mutual love that the pair had for each other though was continually tested, often with one partner testing the other. Many different versions of the Procris myth exist, and it is not easy to reconcile them all, but the story of Procris begins in Athens. Procris was a daughter of King Erechtheus of Athens and Praxithea; making Procris sister to many other siblings including Oreithya, Creusa, Chthonia, Omeus, Metion, Pandorus and Cecrops. Procris would marry Cephalus, a son of Deioneus, and therefore a prince of Phocis. The first test of the relationship between Procris and Cephalus occurred when Cephalus was absent from his wife for a period of eight years. Some say his absence was voluntary, as he wanted to test Procris, whilst others say that Cephalus was abducted by the goddess Eos, who had taken a shine to Cephalus whilst the prince was hunting. In the latter case, despite being in the company of a beautiful goddess, Cephalus longs to return to Procris. 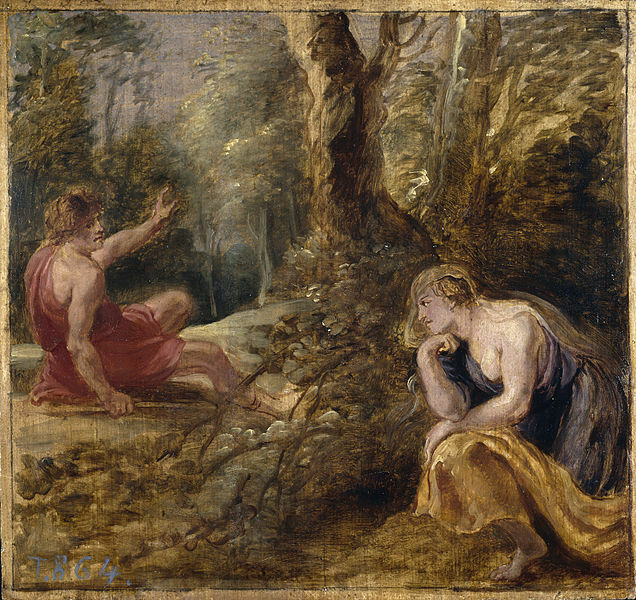 Eos, is annoyed, and whilst agreeing to return Cephalus to his wife, Eos points out how easily Procris could be led astray. Thus when Cephalus returns he is disguised, but Procris agrees to sleep with the stranger in front of her, simply because money was offered. Occasionally it is said that it was not Cephalus who slept with Procris but Pteleon, the hero of Ptelea, who became lover of Procris, when he offered Procris a golden crown, possibly at the suggestion of Cephalus. In either case, Cephalus revealed that the infidelity of Procris had been uncovered, and so Procris fled from Athens. Procris would flee first to the forests where she became part of the retinue of Artemis, although the Greek goddess of the hunt normally required her attendants to be chaste. Therefore, Procris was subsequently said to have been found upon the island of Crete, when King Minos was on the throne. King Minos was suffering from an affliction brought on by the sorcery of his wife Pasiphae; for Pasiphae angered by her own husband’s infidelity had caused his sperm to transform into miniature poisonous creatures like scorpions, killing any lover that Minos might have. Procris though had the skill to cure King Minos, and she did so through the use of the Circaean root, either because she wanted the reward offered by Minos, or because she wanted to make love to the king. King Minos would give to Procris two special gifts, Laelaps, the legendary hunting dog, and a javelin that always hit its mark. These gifts had previously been given by Zeus to Europa, the mother of King Minos. Procris would return to Athens, and some say that Procris would test Cephalus, by disguising herself as a young man. Procris then challenged Cephalus to a contest in hunting, and with Laelaps and the javelin, Procris easily outdid her husband. 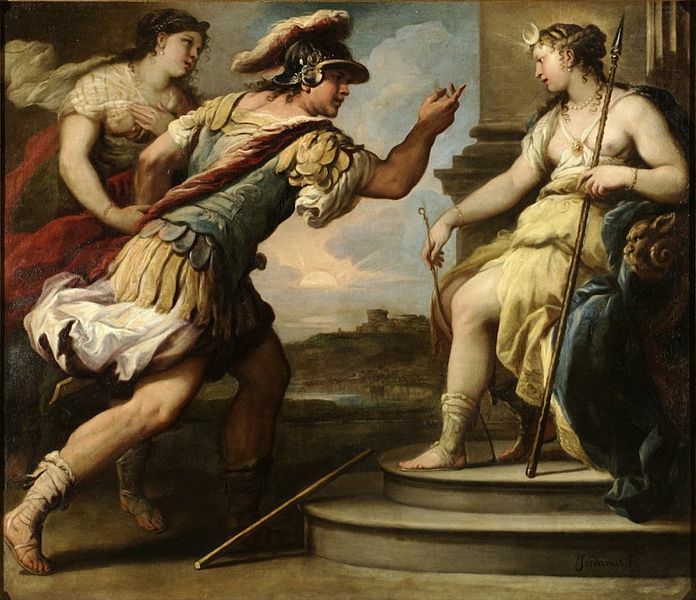 Cephalus sought to buy the hunting dog and javelin, but no matter how much money he offered, Procris refused to sell; Procris would only agree to give them up, if Cephalus slept with her (still in the disguise of man). Cephalus overtaken with a yearning for the dog and javelin agreed. Thus Procris would reveal her true self, and as Cephalus had now done exactly what Procris had previously done, the pair were reconciled. Procris would give Laelaps and the javelin to her husband as gifts. Procris and Cephalus were then said to have become parents to one son, Arcisius, the father of Laertes, thus Procris was great-grandmother of Odysseus. Procris could never be sure about the loyalty of her husband though, and her own doubts would lead to her death. Cephalus was out on the hunt when a servant of Procris heard the hunter call out for someone to come to him, either Nephele, Zephyr or Aura. The words of Cephalus though were perfectly innocent for the husband of Procris was simply calling out for a cooling breeze to cool him down during the exertions of the hunt. The servant reported the words of Cephalus to Procris, and Procris went into the forest to try and catch her husband cheating upon her. Procris though would make plenty of noise as she approached Cephalus, who immediately assumed it was a wild animal, and threw his javelin into the thickets. The javelin would always hit its mark, and so Procris was impaled by the javelin. Though dying, Cephalus managed to explain to Procris that he was not cheating on her, and so Procris died happily in the arms of her husband. Cephalus would ultimately be banished from Athens for killing Procris, although he would ultimately aide Amphitryon in his quest to rid Thebes of the Teumessian Fox, and then again in the war against the Taphians. Subsequently, Cephalus would become ruler of the island of Cephallenia, and would be married again, this time to Clymene.